One of the first topics we covered in astrogeology is impact craters. They are characterized by circular or ellipitical depressions in a planetary body and sometimes contain central peaks. The shape is a function of the angle at which the impactor hits the body and the central peak is a product of isostatic rebound. The more shallow the angle at which the impactor hits, the more oblique the crater. The central peak forms as the crust in the center “springs” to a higher elevation after the impact. 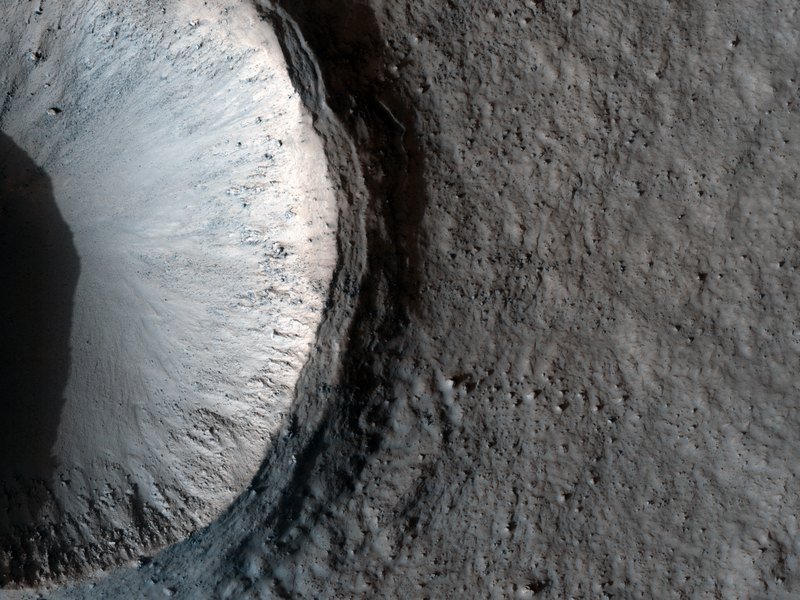 The debris that gets kicked up during this process surrounds the crater and becomes the ejecta blanket. What’s interesting is that impact craters follow nearly the same pattern throughout the solar system. From Venus to the Moon, and Mercury, they all look fairly similar. Throughout it’s 4.5 billion year old history, the earth has been peppered with meteoroids great and small. The small ones either disintegrate in the atmosphere in a blazing spectacle or make it to the earth’s surface and become meteorites. The much larger ones, such as the one that may or may not have killed off the dinosaurs, leave large craters that scar the earth’s surface and inspire some of the worst sci-fi movies and television around (such as this one, that one, and the worst offender of them all). The one in the picture above is the Manicougan Crater of Quebec, Canada. At approximately 215 million years old, it’s one of the oldest confirmed impact craters on the earth (1). That puts it towards the end of the Triassic age, and in geologic time, makes it relatively young. However, it had the unfortunate luck to land in an area that would be smoothed over and reworked by the advance and retreat of glaciers over thousands of years. Over time, and with the help of receding glaciers and human tinkering, the crater filled with water and is now partially used to generate electricity for Quebec and parts of New England. The end. Quick, short and to the point. In 1998 a group of researchers hypothesized that the Manicouagan Crater formed at the same time as four other craters across the world: Rouchechouart in France, Saint Martin in Canada, Obolon in the Ukraine and Red Wing in North Dakota (2). They then used a computer model to determine the position of the earth’s continents at the time of the impact. They found that all but Obolon and Red Wing occurred at the same lattitude. The latter two “on the other hand, lie on great circles of identical declination with Rochechouart and Saint Martin, respectively” (from the abstract, not my words). This means that the craters possibly formed during an impact event from a single asteroid that broke apart as it entered the earth’s surface. The subsequent collision formed a chain of craters that were separated by the slow, random shuffle of the earth’s tectonic plates. For some this may be old news, but for me its new and represents one of coolest things about science blogging. When I write a post, I already have an idea of where I want to go with it and I do a little background reading to verify my claims. In the case of this post, I didn’t count on learning about impact crater chains on the earth’s surface. It’s that sort of discovery that really makes all the mental sweating worth it.